The filigree technique ( from the Latin: filium - thread, and granum - grain) is 4000 years old, as verified by pieces from Troy and Mycenae. Even the Etruscans decorated their weapons and tableware with fine filigree, which is based on the finest wire made from precious metal. Silver wire, wire from 14 carat red gold and 18 carat yellow gold, precious metal alloys which are particularly flexible can be used. First of all the contour of the piece of jewellery is formed. This is a kind of frame. Next the frame is filled with filigree. Usually a much finer wire is required for the filling. This may also be “corded". The thinly drawn wire is then twisted around itself and then rolled to 0.18 mm. Only this technique in gold wire production brings about the fine gleaming shine and vividness in the piece of jewellery. Next the individual, most precisely measured pieces of gold wire are bent by hand using flat and round pliers and formed into delicate shapes. 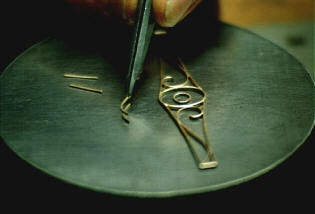 These are then individually inserted into the ready-shaped contour of the piece of jewellery under tension. The tension between the contour and the many elaborate individual parts in the filling must be so great that it is possible to pick up the piece thus created with a pair of tweezers. The flux and gold solder is then applied to the rear side. At an even temperature of 800 degrees this combines with the gold in the filling to produce the final stability. Only then can the piece of jewellery be curved, bent or shaped into a ball. 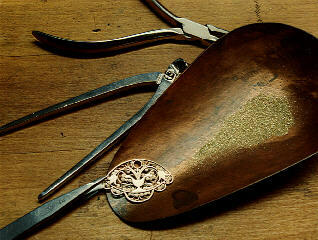 It is only at this stage that the piece takes on its final shape as a brooch or necklace. These pieces of jewellery are always individual as they are hand-crafted in a tradition requiring precision and experience.